Jesus did not condemn the woman caught in adultery, but He instructed her, and, by extension, all who have had their sins forgiven, to sin no more. To learn more about the motives behind the Pharisees’ accusation and why Christ dealt with the situation the way He did, watch this short video presented by Dave Myers, Foundation Institute instructor. The famous story of the woman caught in adultery is found in John 8:1-11. Some of the Jewish leaders brought to Jesus a woman who had been caught in the act of adultery. These leaders constantly followed Jesus throughout His ministry, testing Him with trick questions. Their objective was to try to cause Him to say something that they could use to accuse Him of false teachings (verse 6). Jesus stooped down and began to write on the ground. We don’t know what He wrote, but He did eventually respond to their pointed questions by saying, “He who is without sin among you, let him throw a stone at her first” (verse 7). He apparently pricked their consciences, for the accusers departed one by one until only Jesus and the accused woman were left. Now the law did say that if one was an adulterer, he or she was to be put to death (Leviticus 20:10). Jesus Christ did not say or do anything that indicated that the law against adultery was no longer in force. Having the authority to forgive sin (compare Matthew 9:6), He forgave her instead of condemning her to death for it. He added a very important admonition: “Go and sin no more” (John 8:11). In today’s world, many are confused about the role the law of God plays in the life of a Christian. Oftentimes, people believe that once the blood of Christ’s sacrifice cleanses them from sin (which it does—1 John 1:7) they are no longer subject to the law. They seem to think they can continue to live as they had before being forgiven. But that is not the case. “My little children, these things I write to you, so that you may not sin” (1 John 2:1). It is God’s will that Christians not sin, that is, that they not break His 10 Commandments. Consider an analogy that involves forgiveness and obedience in a nonspiritual situation. Think of an older teenager who does something that is both illegal and contrary to the values his parents have taught him. For the sake of example, let’s say he attends a party where drugs are being sold and used. There is a police raid, and this teenager is arrested. His father has to bail him out of jail. Because of the circumstances, the teenager escapes legal prosecution; but he still faces the disappointment, hurt and shame he has brought upon his family. He realizes the depth of his mistake, having been shaken by the experience of being arrested and jailed. He tearfully apologizes to his parents, asking for their forgiveness. They tell him they love him and forgive him, and everyone embraces. Does the forgiveness of his parents mean that the teenager is free from any obligation to live by their values in the future? Would it be perfectly acceptable for the young person to return to a drug party the next night? No, it would not. Returning at any time to the actions for which he said he was sorry and for which he asked forgiveness, would deeply hurt his parents. It would betray them; it would make a mockery of his repentance and of their forgiveness. Regrettably, a false doctrinal thread—one that defies the common sense that this example illustrates—has worked its way into modern Christianity. That idea is that the forgiveness of Christ for our past sins frees us from all obligations to obey the laws of God in the future. In real-life situations, we would never expect this. Yet many embrace the idea that our Heavenly Father requires nothing of us after forgiving us for breaking His values—His commandments. God’s commandments are laws of the highest order, much higher than any local or national laws. However, many people believe that being forgiven for breaking the holy laws that required the death of Christ frees them to live however they choose. They overlook the plain statement in Romans, in the context of an explanation that Christ paid the death penalty in our place, that “in His forbearance God had passed over the sins that were previously committed” (Romans 3:25, emphasis added). In other words, just as the parents forgave their teenage son in the example above, God offers forgiveness of our past sins. But, as was also the case for the teenager, Christians do not have a license to continue sinning after being forgiven. What about sins a believer commits in the future? Some teach a “fuzzy theology” that those who “accept Christ’s sacrifice” will not sin any more—not because they willfully obey God’s law, but because their nature has changed. The idea that the forgiven will simply no longer want to sin is at the heart of this inaccurate teaching. Both New Testament examples and modern practical experience show that this idea is utterly wrong. Believers forgiven of their past sins still possess the tendency to commit sin. “If we say that we have no sin, we deceive ourselves, and the truth is not in us” (1 John 1:8). In the last half of Romans 7, the apostle Paul acknowledged the power of sin in his life years after conversion. All people—including believers who have had their sins forgiven through repentance, the acceptance of Christ’s shed blood and baptism—still live in a world saturated with the lure of sin. They remain under attack by the chief spiritual enemy, Satan, who wanders about seeking which of them he might consume (1 Peter 5:8). 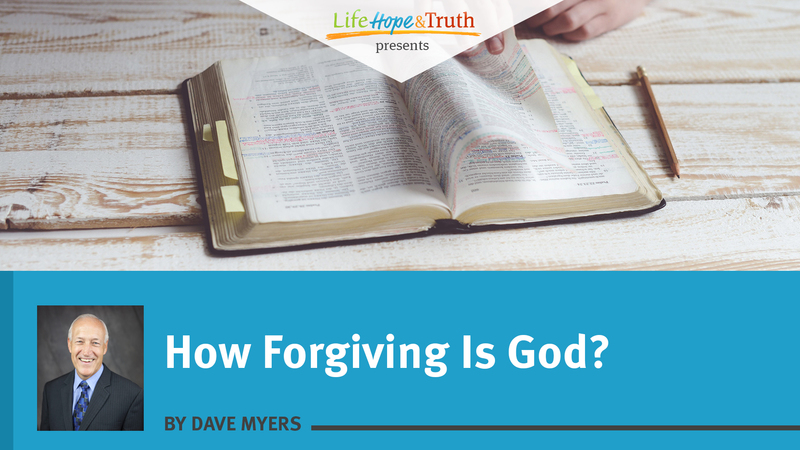 Do believers sin again after they have been forgiven for their past sins at baptism? Yes, they do. Christ’s sacrifice still remains powerful enough to forgive sins in the future. Thinking that obedience to God’s law is not required shows contempt for the incredibly high price that was paid to obtain our pardon for the penalty of our past sins—the crucifixion of the Son of God. But here is the catch: Sins that are not repented of are not forgiven. When a believer sins, he or she must privately repent of those sins to God in prayer. He or she must humbly and sincerely ask for His forgiveness; and God, our loving Father, promises to forgive upon genuine repentance (1 John 1:9). Obedience is required of believers. “We are His workmanship, created in Christ Jesus for good works, which God prepared beforehand that we should walk in them” (Ephesians 2:10). “He who says he abides in Him ought himself also to walk just as He walked” (1 John 2:6). Doing otherwise would show contempt for the forgiveness our Father has generously bestowed! It also would show contempt for the values of His family, expressed in the 10 Commandments. Likewise, thinking that obedience to God’s law is not required shows contempt for the incredibly high price that was paid to obtain our pardon for the penalty of our past sins—the crucifixion of the Son of God. God’s laws are positive and beneficial—they’re like guardrails or painted lines on a highway. They show the way to live that keeps us out of the ditch! They show the way to live that enables us to love God and our fellow humans (from parents, to spouses, to neighbors). They show the way to live that helps us avoid hurting ourselves as well as others. They show the only workable way to peaceful homes, peaceful communities and peaceful nations. Yes, we are required to obey God’s laws; we are required to do what is good for us! Be sure to read the verses cited in these articles, and allow God’s Word to speak for itself on this critical issue. Because so much has been said and written contrary to what the Bible says, it will take time and patience to learn the truth of this critical matter. Our library of articles in the “Change” section will also help.